You probably heard about Mophie, the company that makes some of the world’s most reliable juice packs, charging docks and battery power stations. These power storage tools may be in common with the usual power banks in terms of external power storage capabilities. But when it comes to expecting extreme power reserves, the Mophies are the boss in this department. Mohphie’s are actually compatible for whatever mobile gadget you have. 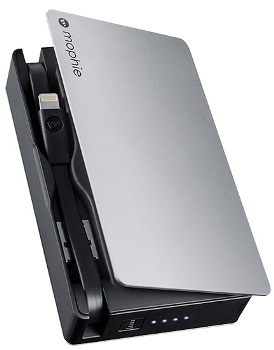 As long as the micro USB port is there, the Mophie Powerstation will charge it. Yet, Mophie Powerstations are recognized to be the best compatible power sources for Apple gadgets, Samsung Galaxy versions and the HTC phones. So what is this about the improved version of the Mophie’s? The new Mophie Powerstation Plus is now more compact and has the integrated cable and sync cables for universal compatibility. It eliminated the complicated need for external cables while its design was made simpler and better styled. Not only that, the casing of the new Mophie Power Station Plus is now made of nice metal finish and with flappable top so you have a quick hand in tucking away its integrated cords. This is now much like a metal cigarette case with solid metal cover for easy inside access. 1. The 3000 mAh battery is best for any smartphones, tablets or any device with micro USB port. Its power charge capacity is twice than the ordinary power storage banks and at faster charging so you can charge your iPhone twice at faster time without worry of power drain. Best for personal use, very light and most compact it can fit in your palm. 2. The 5000 mAh battery is thicker and best for any smartphones, tablets or any device with micro USB port. It has three times storage capacity so you can charge your phones thrice as much or tablet in full and it still have some juice remaining. 3. The 7000 mAh battery is a powerful unit that is capable of charging 2 tablets one at a time and still has some reserves for your smartphone. It boasts of 4 times more energy storage so for mobile phones, this packs a lot of charge it can charge 6 to 8 smartphones continuously. It also has an additional universal USB charging port for extra use. 4. The 12000 mAh Power Station XL model is the largest of all the Power Stations it can charge all the family’s gadgets and devices continuously. Packed with 8 times more stored power, this is the best companion during long trips with your families. It also has an additional universal USB charging port. Mophie Power Stations are always tested hard and they always meet expectations. However, there are a lot of small companies out there that sell imitations so beware. If you want to make sure you purchase the genuine product visit Mophie’s website and purchase from there to get your money’s worth. Some people see these gadgets as bit expensive. But with the convenience you get from them, you won’t regret you have it. How Often Should You Shut Down Your Computer? How Do You Put Picasso in PCs?